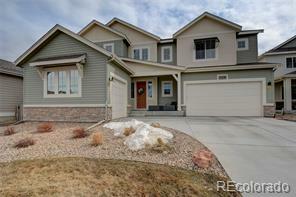 Open floor plan home located in the award-winning Leyden Rock community. Great for entertaining, or family gatherings, this home has so much to offer! The entry hallway takes you to the home office featuring beveled glass French doors. A Chef's kitchen offering stainless appliances includes a convection oven, 5-burner gas cooktop, large pantry, and generous center island. The dining area overlooks the deck that provides a cover to the patio below. The family room has a gas fireplace and plenty of space to stretch out and enjoy a theater experience, with the surround sound speakers. Upstairs a large loft, guest bedrooms and bath, laundry, and an incredibly spacious master retreat. 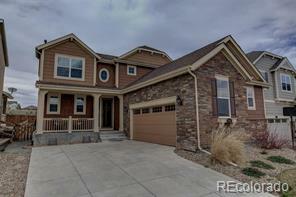 Enjoy game day in the professionally finished, walkout basement (permits with City of Arvada). 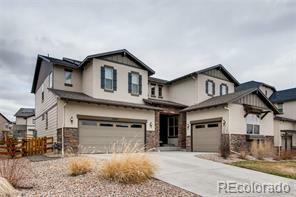 Wet bar, 4th bedroom, tons of storage and patio make this home truly special! Neighborhood amenities include a clubhouse, pool and park you can walk to. Very exceptional home, in an extraordinary location!